In likelihood and Bayesian analyses with the complete data set, as well as in Bayesian analyses with subsets of nuclear genes, only three positions for the root of the placental tree had nonzero probabilities. These were between Afrotheria and Notolegia (Xenarthra + Boreoeutheria), between Atlanto-genata (Afrotheria + Xenarthra) and Boreoeutheria, and between Xenarthra and Epitheria (Afrotheria + Boreoeutheria). Of these, a basal split between Afrotheria and Notolegia received the highest support. Waddell et al. (2001) also favored rooting at the base of Afrotheria based on extensive analyses with amino acid sequences. SOWH tests reported by Murphy et al. (2001b) rejected rooting at the base of Xenarthra, and between Atlantogenata and Boreoeutheria. However, likelihood scores for these root locations are only slightly lower than for the Afrotheria root. This raises the possibility that the sensitivity of the SOWH test may be too high. Buckley (2002) has shown that SOWH tests can give overconfidence in a topology when the assumptions of a model of sequence evolution are violated. Accordingly, we regard Afrotheria versus Notolegia as the best-supported hypothesis, but also recognize Boreoeutheria versus Atlantogenata, and Xenarthra versus Epitheria as valid alternatives for the placental root. Africa (ancestor of Afrotheria) and South America (ancestor of Xenarthra), respectively (Archibald, 2003). This hypothesis is more in keeping with the conventional view that crown-group eutherians originated in the northern hemisphere (Matthew, 1915). The third alternative for the placental root, Boreoeutheria versus Atlantogenata, suggests reciprocal monophyly of Laurasian and Gondwanan moieties at the base of Placentalia, and is potentially compatible with a placental root in either Gondwana or Laurasia. As discussed below, stem eutherian fossils are also important for evaluating the geographic provenance of the last common ancestor of Placentalia. Under any of the three rooting scenarios, the basal or near-basal separation of Afrotheria and Xenarthra may be accounted for by the vicariant event that sundered South America and Africa approximately 100-120 million years ago. If this plate tectonic event is causally related to placental cladogenesis, we should expect a divergence date at approximately 100-120 million years (MY) for the split between Afrotheria and Xenarthra. In agreement with this prediction, molecular divergence dates for the divergence of Afrotheria and Notolegia are approximately 103 MY based on linearized trees and quartet dating (Murphy et al., 2001b). Springer et al. (2003) used relaxed molecular clock methods and estimated this split at 97-112 MY. Archibald (2003) regards the agreement between plate tectonic and molecular dates as coincidental and unrelated. However, there are at least hints from the fossil record that stem eutherians have a deeper history in the southern hemisphere than previously recognized. Rich et al. 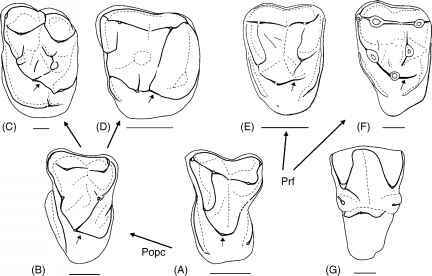 (1997) described ausktribosphenids from the Early Cretaceous of Australia and suggested placental affinities. This hypothesis remains controversial (Helgen, 2003; Kielan-Jaworowska et al., 1998; Luo et al., 2001, 2002; Rich et al., 1998, 1999, 2001, 2002; Woodburne et al., 2003). Perhaps more significant is Ambondro, which is the oldest tribosphenic mammal from the Middle Jurassic of Gondwana (i.e., Madagascar; Flynn et al., 1999). Luo et al. (2001, 2002) argue that Ambondro belongs in the clade Australosphenida, along with ausktribosphenids and monotremes, and that tribospheny in this clade evolved independently from its origin in Theria. In contrast, Sigogneau-Russell et al. (2001) suggest that Ambondro is antecedent to Laurasian Cretaceous Tribosphenida and further state (p. 146) that "the tribosphenic molar may thus have evolved in Gondwana in the late Early Jurassic and from there have spread to (and diversified in) the two hemispheres..." In addition, cladistic analyses offer the possibility that Ambondro is a stem eutherian (Woodburne et al., 2003). This hypothesis demands a marsupial-placental split no later than 167 MY, which is in good agreement with molecular dates for the marsupial-placental split at 173-190 MY (Kumar and Hedges, 1998; Penny et al., 1999; Woodburne et al., 2003). If stem eutherians were in Gondwana in the Jurassic, a Gondwanan origin for crown-group placentals becomes more plausible.